The USS Dwight Eisenhower. Do the Iranians really want to fight the US? JERUSALEM – Israel views the threat posed by a nuclear-armed Iran with greater urgency than the rest of the world, Israel’s defense minister said Monday. Ehud Barak also reiterated recent Israeli assessments that Iran’s nuclear program is on the verge of becoming immune to disruptions by a possible military strike. WASHINGTON — A classified war simulation held this month to assess the repercussions of an Israeli attack on Iran forecasts that the strike would lead to a wider regional war, which could draw in the United States and leave hundreds of Americans dead, according to American officials. 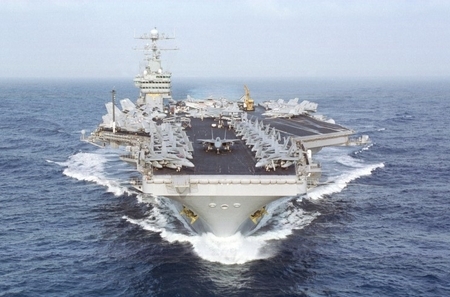 The two-week war game, called Internal Look, played out a narrative in which the United States found it was pulled into the conflict after Iranian missiles struck a Navy warship in the Persian Gulf, killing about 200 Americans, according to officials with knowledge of the exercise. The United States then retaliated by carrying out its own strikes on Iranian nuclear facilities. Hmm, wouldn’t it be really, really stupid of the Iranians to piss off the US Navy? I think so, but the real story here is not what is theoretically possible — after all, an Iranian missile could hit a ship of the Great Satan tomorrow, if the Iranians were that dumb. Certainly Iran has threatened that it would retaliate against an Israeli attack by attacking US forces. But actually carrying out this threat would be suicidal. Sure, the American people don’t want another extended war, but they would happily approve a punitive bombing campaign that would wipe out the nuclear program, and a bunch of other military assets. The Iranians know this, the US administration knows this, and both sides know the other knows it. The point of the Iranian threats is not to influence our government or military, but to generate sentiment in the US against an Israeli attack and against Israel. And apparently the administration wants to help them do that, which is why they leaked this story to the Times. One obvious reason is that the administration simply doesn’t want any trouble or uncertainty before the election. But the time frame involved is such that this puts Iran into Ehud Barak’s “immunity zone,” in which an Israeli attack would not be effective. To put it another way, the US wants Israel to give up its ability to be “[master] of our fate,” in the words of PM Netanyahu, in order to help re-elect the President. The election is not the only issue. The administration wants Israel dependent on it so that it can pressure it into making concessions to the Palestinians, so that it can realize its wish — based on ideology and an (unattainable) desire to make friends in the Muslim world — to force Israel back to 1949 lines. A triumphant Israel which has eliminated, or at least seriously delayed, the Iranian nuclear threat — and most likely also destroyed much of the capability of Hizballah — will be in a much stronger position in negotiations. Israel is facing one of the most difficult moments of its life. Once again, as in 1967 and other times, an Israeli PM is faced with choices that may make the difference between life and death for his nation and his people. Once again, the US is proving to be a slim reed to lean on. This entry was posted on Tuesday, March 20th, 2012 at 9:22 am and is filed under General. You can follow any responses to this entry through the RSS 2.0 feed. Both comments and pings are currently closed. The U.S. Government is clearly trying to do all it can to prevent Israel from making a strike on Iran now. But this does not mean that such a strike is from Israel’s point- of- view wise at this time. I do not know the answer to that. Barry Rubin has said that he believes such a strike will occur in 2013 or 2014 and that he believes it unwise, though will of course support Israel in the best way he can after it has been made. He believes that the real impending threat to Israel is from Egypt where its new President is likely to be a Muslim Brotherhood supporter.